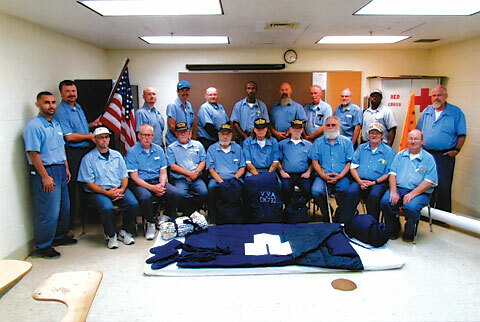 Members of Douglas E. Dahill Memorial Chapter 732 at the Allen-Oakwood Correctional Institution in Lima, Ohio, have created the Triple Duffle Bag Project to help homeless veterans and others in need. They were inspired by an article in The VVA Veteran (September/October 2014) that described a project by Morristown, Tenn., Chapter 1073 to make and distribute duffle bags to homeless veterans. The chapter produces a three-in-one set. There is a small 24-inch shower and hygiene bag with a handle. In addition, there is a 36-inch snacks and clean clothes bag with a shoulder strap. Finally, the chapter provides a large 44-inch dual-strap backpack-style bag that includes a sleeping bag, a sleeping mat, and a pair of mittens. All these products are made from recycled material. The bags, sleeping bags, and mittens are made from scrap cloth donated by the Ohio Penal Industries Garment Shop. Public donations of plastic shopping bags are repurposed into sleeping mats. The prison’s branch of the American Red Cross fabricates sleeping bags, mats, and mittens. Hygiene products are donated by the prison’s Blue Phoenix Project. This project has involved extensive collaboration with the parent chapter, LZ Lima Chapter 89. Other organizations have donated supplies and taken responsibility for distribution. 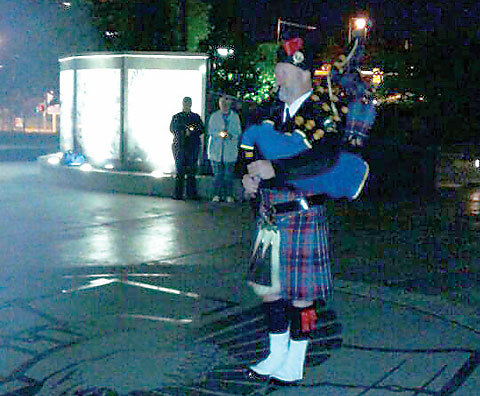 These include the Allen County Sheriff’s Department, Blue Star Mothers, the Allen County Veterans Food Bank, the Lima Police Department, and many local and regional members of VVA. Before the triple duffles are distributed, Chapter 89 has them and their contents waterproofed and stenciled with the Chapter 732 logo. The Military Order of the Purple Heart provides drawstrings. Since April 2015, more than 125 bag sets have been distributed, with many more in production. The bag designs were created by Chapter 732 members. The instruction manual for bag fabrication, with diagrams, has been distributed to other incarcerated chapters, as well as to several Boy Scout troops.